Congress Councillors, who happen to be in the Opposition in the municipal corporation, today bent backwards to appease the Mayor to get their delayed development works done. 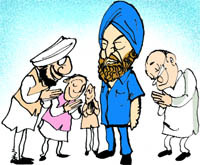 It came as a surprise to everybody, who attended the meeting as 10 Congress councillors led by Sham Sunder Malhotra resorted to tactics like flattering and sycophancy to please Mayor Hakam Singh Giaspura. Is the municipal corporation top brass ineffective in ensuring its instructions are carried out by the civic staff? The answer may lie in mayor Giaspura’s observations when he told Congress party councillors present at a meeting that civic officials did not pay heed to the orders issued by him or by the MC commissioner. Unlike earlier occasions when there used to be a virtual scramble for grabbing prime properties put on sale through public auction by the Greater Ludhiana Area Development Authority (GLADA), only three out of 18 residential plots in Urban Estate (Phase II) in Dugri put under the hammer attracted buyers today. And the sales proceeds, too, yielded a marginal premium of just about 1.24 per cent over the reserve price. Following numerous reports of buckwheat flour (kuttu atta) poisoning from various parts of Punjab, city traders have lost considerable business over the past couple of days with consumers shying away from buying the “Navratra” special flour. Buckwheat flour referred to as “kuttu ka atta” is relished by devotees during Navratra festival. The flour has a higher content of protein that causes stomatitis (oral inflammation and ulcers) and cramps in stomach in people with digestive disorders. After the recent revelation of Ludhiana’s skewed gender ratio in 2011 Census, two incidents of female foetus found from different parts of the city yesterday has put authorites in the backfoot. These foetus were found from Sarabha Nagar and the Kalsia Street of the city. Keeping in mind the importance of visuals, the Sarv Shiksha Abhiyan (SSA) has introduced posters that have pictures as well as text. These posters are self-explanatory. 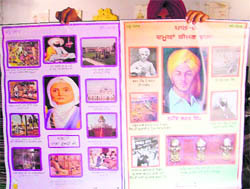 For example, Shaeed-e-Azam Bhagat Singh’s poster has his childhood picture. Be it the time when the great martyr was in jail, or the bloodshed of Jalianwala Bagh in 1919, everything has been described in the poster. For the past couple of days residents of Lakkar Mandi and Prem Gali, falling in wards no 10 and 11, have been complaining about getting contaminated water supply, which they allege is drinking water mixed with water from leaking sewage pipes. On Thursday the residents staged a ‘dharna’ (sit-in) to protest against what they called the callous attitude of civic officials in failing to get broken sewer lines in the area repaired over the past several years. Ludhiana has risen to extend support to social activist Anna Hazare in his crusade against corruption as people from all walks of life are doing their bit by taking out candle light marches, skipping meals and sitting on hunger strike, all as a mark of solidarity. Raising doubts over the proposed goods and service tax (GST) regime, the industry here has opined that the model conceived in the Bill was not the one it had been clamouring for. Having failed to win the confidence of a majority of councillors, the chief of the local civic body, Usha Sood will have to face a no-confidence motion soon. Unruly scene was created at the Mayor’s official residence as councillors and sanitary staff had heated arguments with each other in front of the Mayor on the issue of getting the attendance of sanitary workers registered with the councillors. In order to ensure that the building bylaws are implemented in the city in proper manner, Additional Commissioner of Municipal Corporation (MC) Kuldeep Singh inspects sites of various under construction buildings. Posing a challenge to the state government’s authority, city mayor Hakam Singh Giaspura on Thursday issued instructions that from now onwards site maps of buildings to be constructed in an area of over 500 square yards would be approved at the local level. 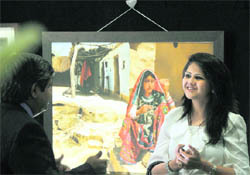 Various city hospitals and organisations observed World Health Day today. The young Indian classical vocalist from Ludhiana, Kapil Sharma, who was recently given the President Award, has now been conferred with Awadh Bharat Samman. The technology of making green chilli powder and puree was introduced to inmates of Ludhiana Central Jail here today. Advantage of Poland’s location in Eastern Europe, tax exemption in SEZ, grants given by the European Union (EU), access to European transport corridor, huge domestic market, skilled and cheap workforce and strong educational infrastructure are a few key factors that make it one of the most attractive business destination in Europe. This was stated by Piotr Klodkowski, Ambassador, Republic of Poland in India, while addressing members of the Ludhiana Management Association (LMA). The Sarv Shiksha Abhiyan (SSA) has become a hit with students of Classes V to VIII, as the students have not only received free textbooks of science, mathematics and English, but also practical notebooks of science and mathematics. Failure on the part of Sacred Heart Convent School, Sarabha Nagar, to provide pre-board examination report cards to students seeking admission to Class XI, has put their career in a jeopardy. A five-day food festival “Taste of India” organised by the RIMT Institute of Hotel Management and Catering Technology concluded here last evening. Taking serious note of the “carefree” attitude adopted by government college lecturers while marking their regular attendance in colleges, government college principals in the state have been asked to maintain an attendance record of the lecturers. The police has initiated probe into death of Naresh Kumar Nechhi (39) of the Azad Nagar area, whose body was recovered from a pond near railway track near here yesterday. An NRI was killed in a road accident near Sawadi Khurad village on the Sidhwan Bet road, about 5 km away from Jagraon, last night. A food and civil supplies inspector was allegedly attacked with rods and sticks when he was coming out of his office on Tuesday evening. Victim Nirpaksh Mattu is presently undergoing treatment at the DMCH.